The summer’s most sought after ‘secret,’ Dîner en Blanc returns to Philadelphia this week at a secret location revealed only minutes before the festivities begin. This très chic picnic, imported from Paris, is part mystery tour, part pop-up feast and part je ne sais quoi. Event will take place RAIN OR SHINE. Media credentials are available by emailing kory@aversapr.com. Only media who have signed up in advance will receive notification of the event location 30-45 minutes before participants. Reporters and crews are asked to wear white to blend into the artistic nature of the event. The location of the event is kept secret until the very last minute adding excitement and mystic to the evening. Secrecy is key to its success and fun! Diners will celebrate and re-purpose a highly-visible public space by enjoying an unforgettable evening and partaking in the unexpected. Participants will reconnect with old friends, form new relationships and celebrate a new Philadelphia tradition. Past locations have included JKF Bridge, Logan Circle and Broad Street/Avenue of the Arts. 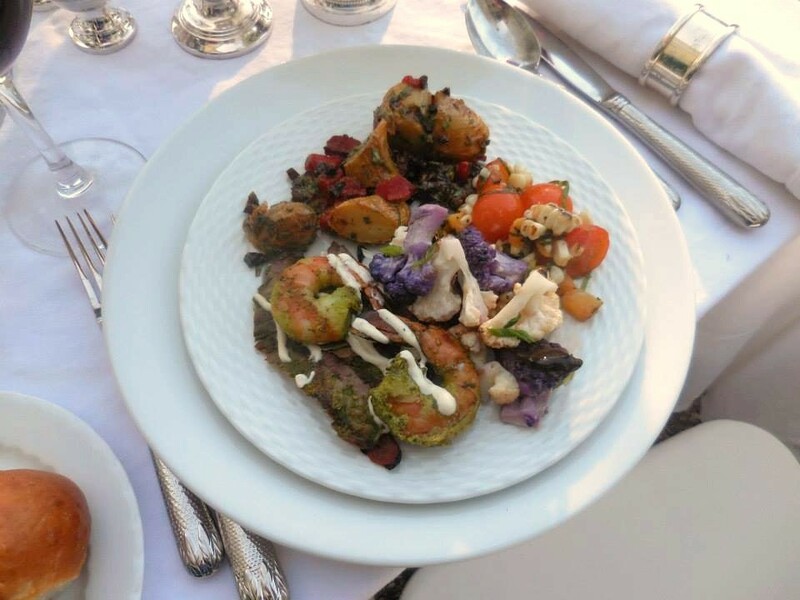 Culinary and culture enthusiasts dressed in white will converge upon a secret locale for an unforgettable evening of elegance, beauty and magic. Registrants will come prepared with tables, chairs, non-disposal supplies, food and wine. Evening festivities will include napkin waving, sparkler lighting, live music, dancing and dinner as art form. 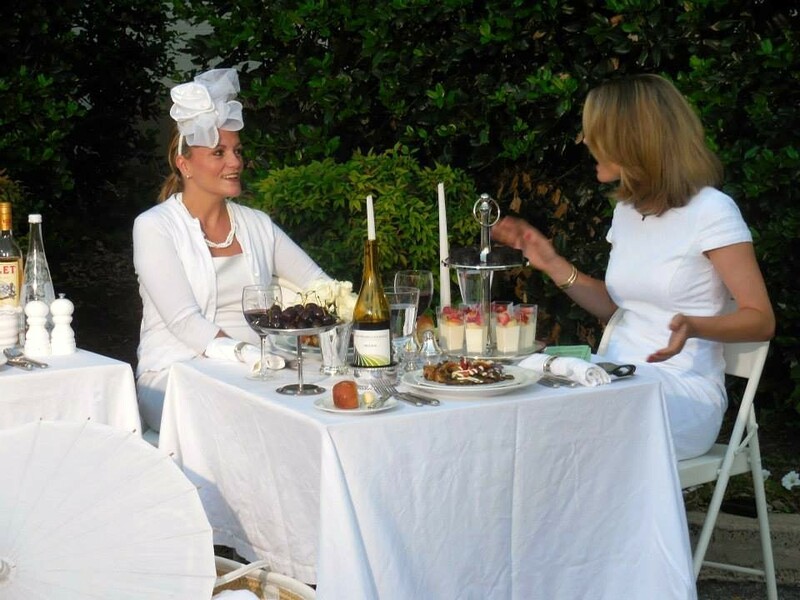 Launched more than 25 years ago in Paris, Le Dîner en Blanc promotes friendship, elegance, gallantry and a sense of community. Now held in over 60 cities in more than 25 countries around the world, this annual secret affair brings an unforgettable evening of beauty and magic for the all dressed in white foodies and cultural enthusiasts. Philadelphia's edition of Diner en Blanc is presented by co-hosts Natanya DiBona and Kayli Moran. 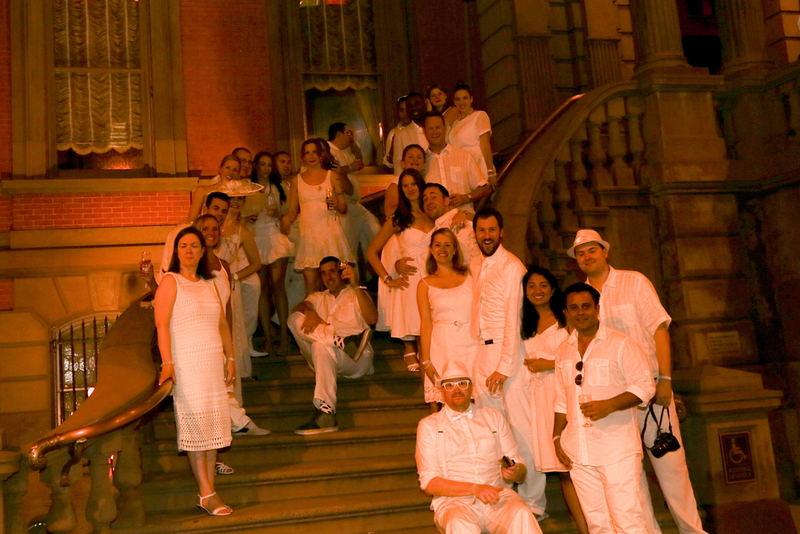 [DEB PR] Apothic Wine is proud to be the Official Wine Sponsor of the 2015 U.S. Diner en Blanc series. Celebrity Cruises is proud to be the Official Modern Luxury Vacation Partner of the 2015 U.S. Diner en Blanc series. - Parade of white throughout the city as participants discover the secret event location. - White-swathed tables, linens and décor appear in artistic roll out in a public space. - White napkin waving signifying the official start of dinner. - Sparklers to light up the night towards the close of dinner and signal the opening of the dance floor. - Interviews will be available with organizers, participants and government officials. 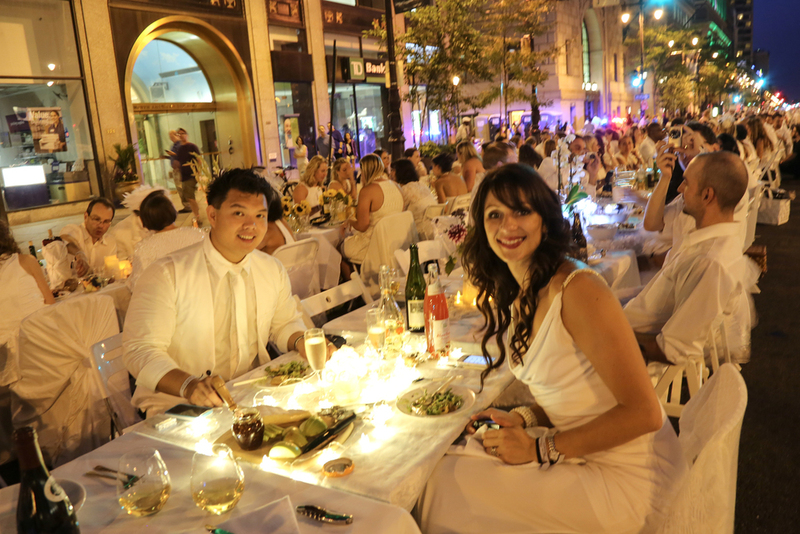 Diner en Blanc Philadelphia dazzled the city by popping up on Thursday, August 21, 2014 at the secret location revealed to be the Avenue of the Arts. 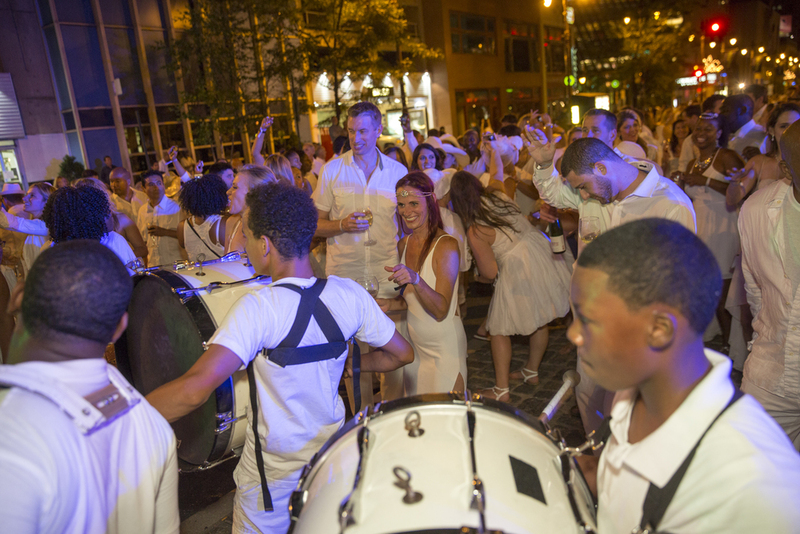 This year, it was a sea of white as far as the eye could see as 3,500 guests decked out in the hottest white fashions filled Broad Street from Pine and Chestnut Streets. Aversa PR and Events was proud to again be the official public relations company for the local installment of this pop-up picnic, viral movement and global phenomenon. Special thanks to co-hosts Natanya DiBona and Kayli Moran for including us in one of the city's most memorable events. Their attention to detail, grand vision and love for our city produced an event that will never be forgotten. Congratulations also go out to the 100 volunteers that worked hard to ensure a picture perfect evening. Finally, special thanks to our entire PR team for 2014, including Lauryn Resotka, Gabbi Townsend, Eri Washington and Dash Sears. They say a picture paints a thousand words. Indeed they do when it comes to a truly viral event! This year, thousands of gorgeous photos popped up around the globe on Twitter, Facebook, Pinterest, Instragram, Google+ and other platforms. 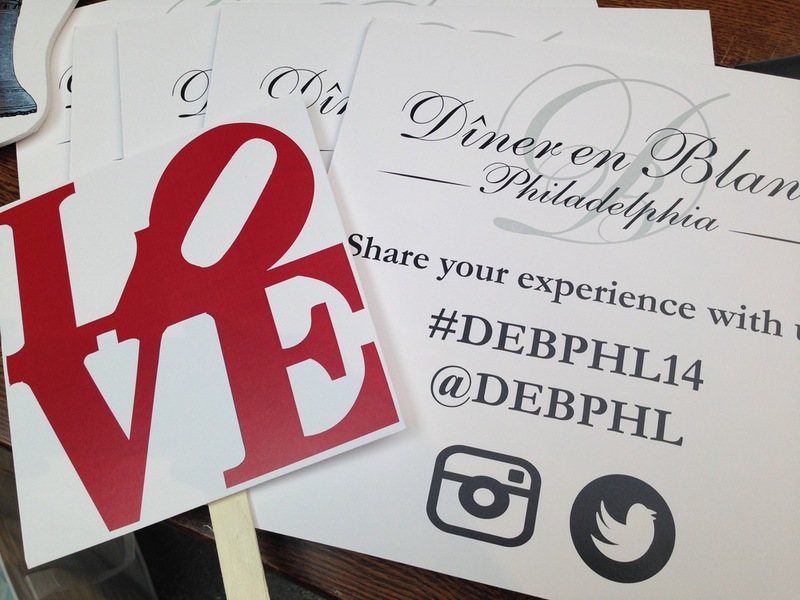 Search for the official hashtag #DEBPHL14 as well as #dinerenblanc and #debphl. Thanks to our sister cities around the globe for sharing our images and all of your support! For a recap of our favorite photos from the night, visit our official album below featuring breathtaking shots from Johanna Austin, Hughe Dillon, Charles Mosteller, Alessandra Nicole, Inna Race, Patrick Hagerty, and our staff photographers. 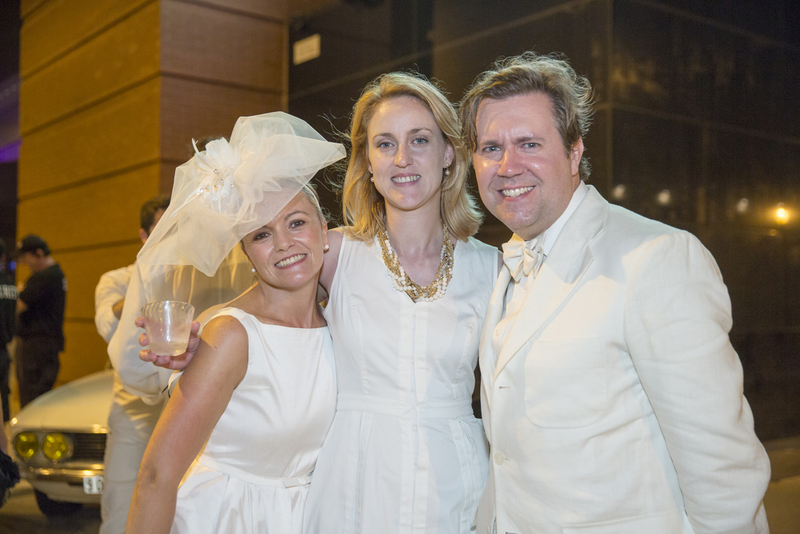 Now in its third year, Diner en Blanc Philadelphia continued to garner interest locally, nationally and internationally. Stories started to go viral 24 hours in advance of the event, and the event trended in Philadelphia for up to 48 hours. Over 100 news stories and mentions included 35 radio and television spots that reached millions of viewers and listeners. Print and online reach nearly doubled that of the year prior, with additional stories to come as we enter September. 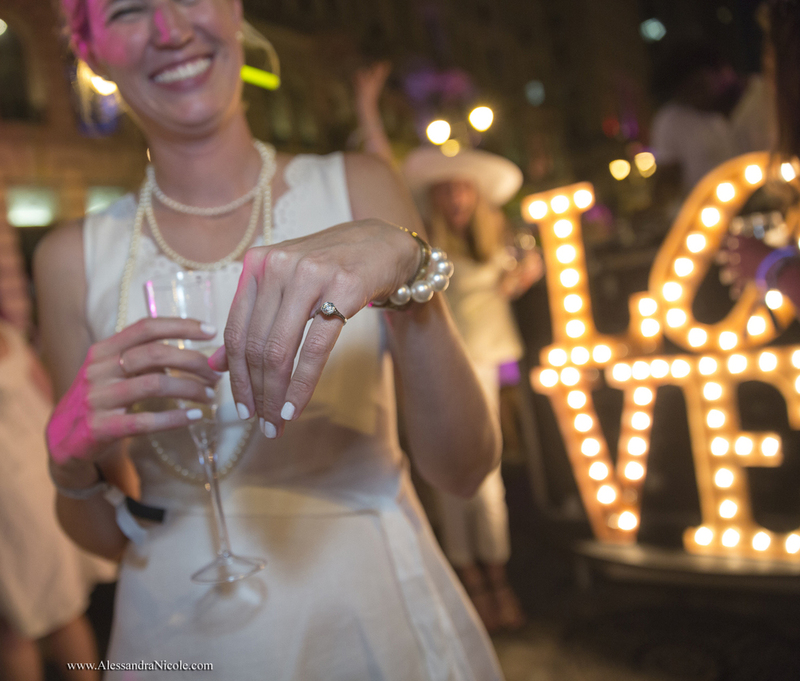 Philadelphia Magazine - Wedding - There Were Two Proposals at Philly’s Dîner en Blanc! Other highlights include the following - please let us know if we missed your favorite. Post any additional stories in the comments for our review. 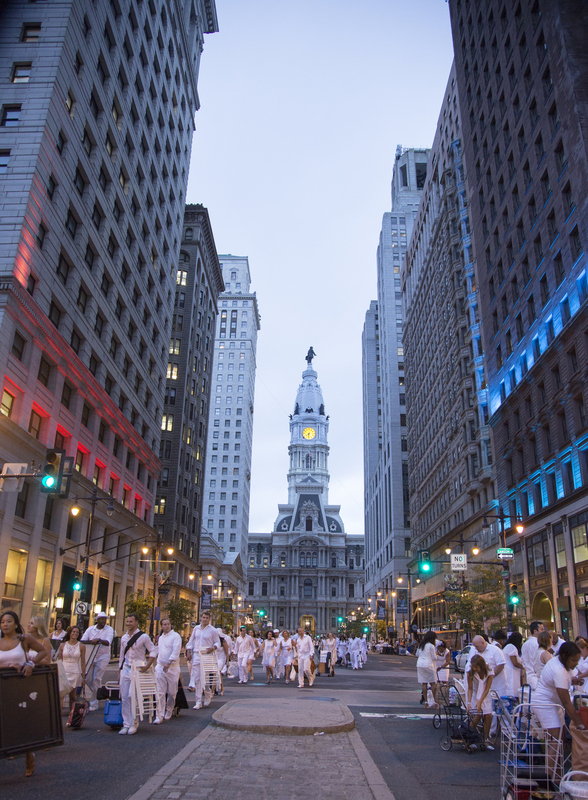 Philadelphia Magazine - Foobooz - Diner en Blanc Returns to Philadelphia. Wait List Open NOW. Leading up to the big day, Diner en Blanc Philadelphia dropped by local television studios for a special preview of the magic. Visit below for our favorite shots from the shoots on Fox 29's Good Day Philadelphia and CBS Philly. The final destination wasn't the only surprise this year! Co-hosts tapped local talent to design one-of-a-kind fashions for a one-of-a-kind evening. Check out shots from the initial design consultation and subsequent fittings with Project Runway winner Dom Streater. Stay tuned to Facebook and Twitter as the co-hosts roll out the official video for Diner en Blanc Philadelphia, along with time lapse footage, photo booth montages, photo albums and more. Stay tuned in coming weeks! Until next year, merci and au revoir!